1 : Brush your pretty locks. 2 : Make half a pony tail by using a small hair tie. 3 : take your pony tail halfway trough the hair tie, to create a ‘loop’. 4 : Split the loop in half. 5 : Grab the leftover piece of hair, and fold it over the middle. 6 : Secure with a bobby pin. 7 : Make sure that you can’t see the bobby pin. 8 : Take one of the ‘loops’ and spread it over the side of your head. 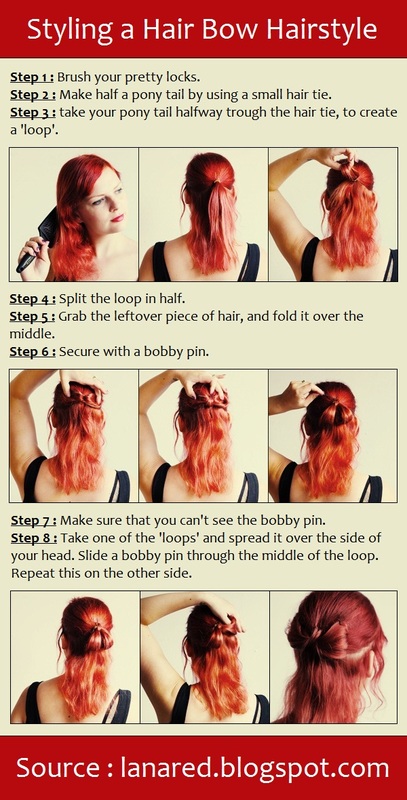 Slide a bobby pin through the middle of the loop. Repeat this on the other side.